The Maxwell Given manuscripts consist of 28 volumes of work, which were purchased by the Public Record Office of Northern Ireland. These volumes are a real treasure for the local historian and represent a lifetimes work and research on the history of Coleraine and surrounding area. They give a fascinating insight into the social, political, religious and economic life of the region from earliest times. Given was considered to be an expert on the local history of Coleraine. The volumes are mainly made up of transcripts from antiquarian books, the Coleraine Chronicle newspaper, O.S. memoirs, Calendar of State Papers Ireland, Coleraine Corporation records (substantial) and various family histories. 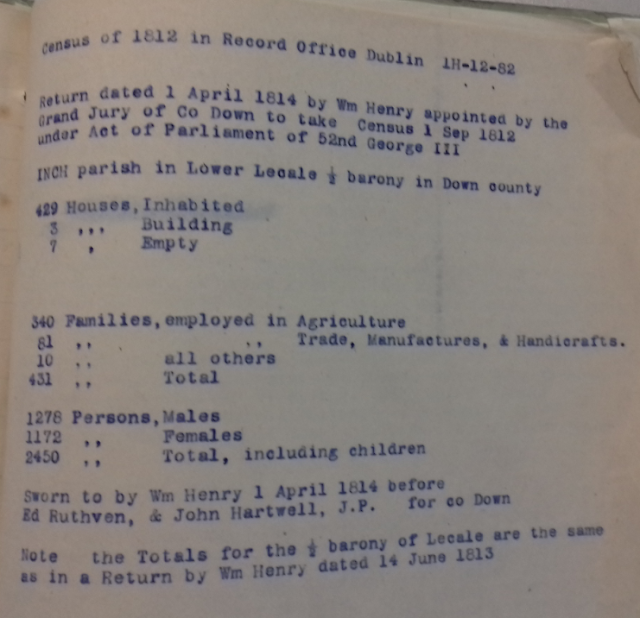 There are also transcripts of local Subsidy Rolls and Hearth Rolls taken from the Public Record Office in Dublin before the fire of 1922, of particular interest to the genealogist. In volume 3 the author notes a birth from the Coleraine Chronicle, ‘March 31st 1866 at Main Street Limavady, on Saturday 24th inst, the wife of Mr George Given Architect, of a son’ i.e. the present writer Maxwell Given. In a number of the volumes Max Given outlines his family history and the connection to McFeeters of Myroe (volume 7 and 12). Max Given appears to have been given access to a number of manuscripts that are probably no longer extant. Volume One contains transcripts of the Mss of John Orr Esq linen merchant (included many Orr family events). In volume 13 and 18 there are substantial transcripts of the Mss Journal of John Galt 1815-1819 (born 1767 died 1845) and in the latter volume also the Mss of Thomas Camac of Derrykeirgan. He also details an oral history of the O’Mullans by Jeremiah O’Mullan (volume 13). For those interested in Coleraine there are many interesting articles and transcripts including the case of the abduction of Sarah Thompson of Macosquin in 1734 (volume 20), a list of Coleraine teachers from 1613-1706 (volume 22), a muster of the Coleraine Yeomanry 1795 with 116 names (volume 12) and a history of the Coleraine Dominicans (volume 25). An important genealogical source is a transcript of the ‘1839 New Directory of Coleraine, Portrush and Portstewart’ (volume 6 pages 1460-1489). Whilst copies of this directory are available in regional libraries, Given includes a description of the directory, in his possession, which had belonged to Robert Given Esq JP of Coleraine and adds genealogical comments in the margins (dates of death, gone to America and so on). In volume 17, there is a transcript of two volumes of the entry books of the Excise Office of Coleraine, 1837-1848 (pages 3823-3831). This is an excellent source of names including a list of keyholders’ in the town of Coleraine, the addresses and business conducted in each shop. There is also a list of shopkeepers’ in Coleraine in the year 1820 (volume 20). Taylor and Skinner’s Road Maps, 1777. Waterside applotment, Coleraine for 1812 (184 names) ps 38-41. From the Ms Journal of John Orr. Substantial transcripts of Coleraine Chronicle from the first edition onwards. May 5th 1849: Limavady – a tale of the O’Cahan’s written for the Coleraine Chronicle (2 and ¾ columns) by A.C Dromore of Limavady dealing with the last occupation of the castle at Dogleap. Jackson/Alexander family of Coleraine/Limavady. The Jackson male line has died out but extant through a female line in the Alexanders’. Continuation of transcripts of Coleraine Chronicle (pages 543-789) from 1856-1867. Religious census 1766 (pages 893-894) Numbers only for Balteagh and Tamlaght Finlagan parishes. New Row history: substantial transcripts. The last chief of the O’Cahan’s. Page 1029 – the trial of Sir Donel O’Cahan – names 73 jurors (as in TH Mullin’s book – the Ulster clans). Memorials of the late John Boyd Esq, MP for Coleraine, published by the Coleraine Chronicle 1862. Includes a history of the Boyds. Reid’s History of Presbyterian Church of Ireland (Volume 1 and 2). Proceedings of the Presbyterian Historical Society of Ireland (1934-45) Typed notes: Fasti of Presbyterian church in Ireland. Depositions from the 1650’s from 1641 rising e.g. pages 1358-61: Deposition of Nicola the wife of James Fulton of Dunboe, 1652. 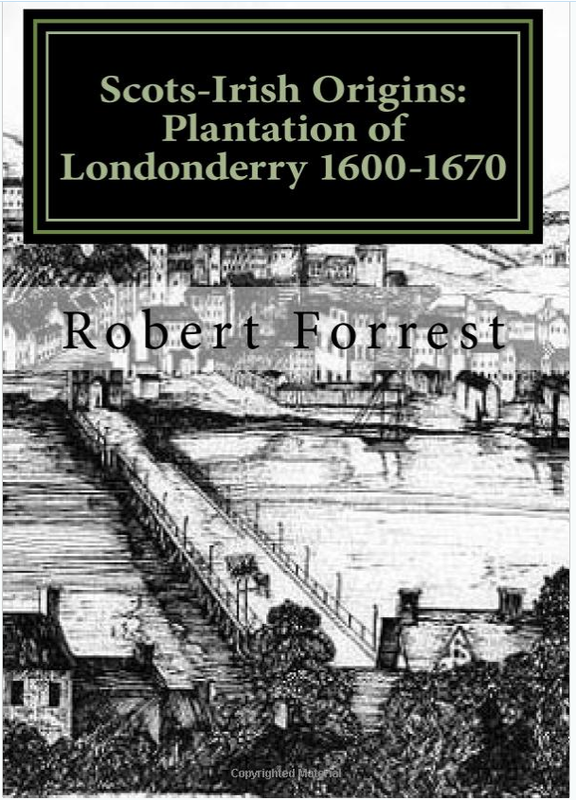 CSPI 1647-1660: includes comprehensive description of Coleraine in 1611. Lists Ministers and Elders (Dunboe etc). Synod of Antrim 21st June 1737 – Minister James McCurdy; Elder William Sheerar. Ms Journal of John Galt 1815-1819 (he died 1845). 1839 New Directory of Coleraine, Portrush, Portstewart (pages 1460-89) including a description of the directory, which had belonged to Robert Given Esq JP of Coleraine with added notes e.g. dates of death, gone to America etc. David Beverlin was a Publican, Rosemary Lane, Coleraine. Paul Sherrard was a publican in Killowen. Rebellions in Ireland (1801) by Sir Richard Musgrave Bart. Historical narrative of Irish society to 1898. History of Coleraine Borough – substantial. Borough of Limavady (as in Boyle’s records of Limavady). 17th September 1611 – Mr John Tanner mentioned as Minister of Coleraine and mentions Sir Thomas Phillips Knt. Information (about 6 pages) on max Given’s family history – Limavady. Given’s married into McFeeters in Myroe. Some gravestone information - comments on different spellings of surname Given, Giveen, Giffen etc). Hill’s Plantation, includes numerous families such as the Alexanders. House of Lords – Skinners company and the Irish society includes list of tenants of Irish society in Coleraine 1789, pages 2039-40. Max Given dates this as 1830-35. Dunboe schools; Killowen – OS memoirs Killdollagh. Page 2315 – 13th August 1739, Arthur Forrester Burgess (elected Chamberlain). Page 2316 – 5th September 1740, William Forrester. Journal of Irish House of Commons. Burgesses, Borough of Coleraine, Chamberlains of Coleraine. Arthur Forester – 1739, 42, 43, 46 (ibid). County Derry Constituency elections 1713. An inquisition taken at Lemavady 1614 – lists jurors, pages 2506-07 (1. John O’Kenny, 2. Gilduffe McBrien O’Cahan etc) 15 names; all gentlemen of Limavady. Coleraine and Killowen Dispensary committee (minutes). Volumes 1, 2, 3, 4, 5, 6 (Convention of Drumceatt), 7, 8 (McQuillans) and 9. 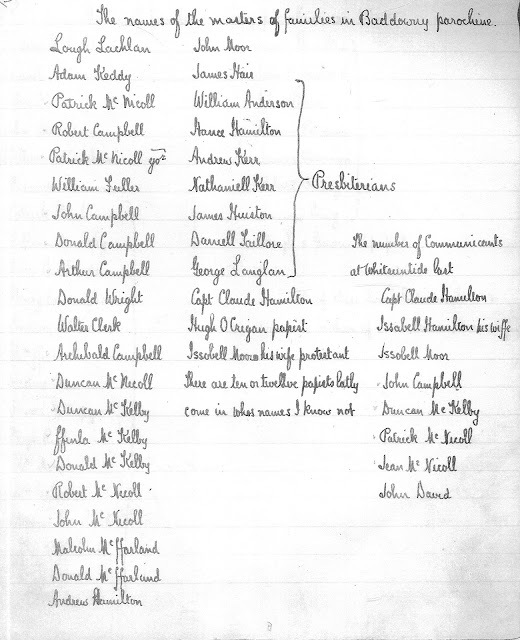 Yeomanry 1796 – 116 names from Corporation records of Coleraine (Corporal Archibald McFetrick). 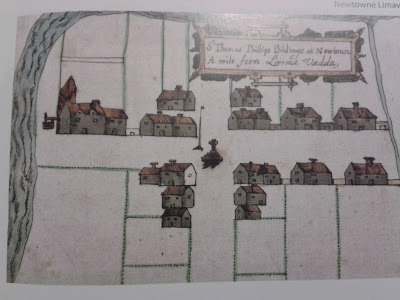 History Ireland 1640-1652 – Coleraine index. Portstewart Parish of Agherton + Ballyrashane, Ballywillan, Killdollagh, Killowen, etc. Frederick Augustsus Hervey Earl of Bristol and Bishop of Derry. Mss Journal of John Galt (born 1767 died 1845). Notes on farming/weather and contemporary history. Note by Max Given – see pages 5607-8 and 5720-21 for hearth rolls for parishes of Ballyaghran, Ballywillin, part of Ballymoney and Dunboe. Deputation report of the Irish society 1814 (79 names of subscribers to new School for Coleraine, 1814). Notes on Rev Robert Stirling and descendants (Minister of Dervock). Includes pedigree chart. Sir Robert MacKlelan (Haberdashers’ and Clothworkers’). 192 men with lists of weapons. Crown rentals 1657 Derry (page 3579), by Barony including chief Tenants. Will of Lady Ann Cooke 1679. Will of John Adams, Mayor of Coleraine (1716). Page 3710 – William Boyd’s commission to USA. Names of emigrants – petition to Governor Shute. Knox family of Coleraine (Loose sheets in book). Grand Jury e.g ‘William Nesbitt of parish of Tamlaght Finlagan, John Rosse of Rathbride (Rathbrady, Limavady), John Cooke of Lemavaddie’. Coleraine Corporation records 1792-1840 (substantial transcripts). Substantial lists of names e.g Page 5148: Year 1699 (1700) 24th January – at this court William Barwick junior and William Forester were admitted freemen of this Incorporation, paying the officers fees. Application lists for freedom of the Corporation of Coleraine c.1832 (pages 5459-5477). A list of applicants from Coleraine and surrounding areas (over 1000 names). Hearth money roll Dunboe (57 names), pages 5720-5721. Vestry minute book Killowen parish (1747-1872), substantial transcripts: Parish Cess 1841 etc. Richard and Torrens of Somerset, County Derry (5656-57). 1641 rebellion – depositions TCD. Annals of the 4 Masters. Pages 5832-38: Tithe List Coleraine parish 1689 (British museum Mss 19864) and also Tithes 1690 e.g. 1690 – George Bellas 6 shillings. Coleraine Corps Yeomanry 1796: alphabetical list – 134 names. Ironmongers’ and the London Companies. Sir Thomas Phillips’ lands 1612. John Rowley’s estates 1656 (denominations). Limavady in 1839 (based on the New Directory) Lists names of shopkeepers, (pages 6213-6220). Coleraine linen seals (and merchants). Persons whose claims were not disposed of by the Corporation on 11th April 1832 (names – alphabetical). NB – note by Max Given – complete list of names to be found pages 5459-5473 (Ms Journal 22). Mr Joseph Cocherane – history. Also OS memoirs. McCleland genealogy pages 6607-08, including pedigree chart. Celtic mythology/Irish history: Chronicles etc. Pedigree Thomas Torrens, Dungiven page 6665. Richardson of Somerset (Wills). Genealogy chart. Defenders of Derry 1692 (pages 6701-06) 215 names listed. Parish of Coleraine Vestry Book 1769-1816 (transcripts).